Is there an economic recovery in place? Maybe yes, in the last three months most of the financial and economic data has been experiencing a steady upturn behavior. It is truth that it can´t be said enthusiastically that the economy is back to a positive domino effect; but the current figures are showing that we have curved to a positive path. The exchange rate has gained stability now rounding the $13.50 Pesos per 1$US; the Mexican Stock Exchange index is close to the levels experienced before Black October just about 30,000 points; the Crude Oil price per barrel is getting closer to the budget of US$70; Mexico´s sovereign risk rate (measured by J.P. Morgan's EMBI+ index) is getting closer to the 200 points base reported before the crisis; the inflation rate and the government bonds interest rate have also experienced positive results. However, the big withdrawal comes from the unemployment disaster. 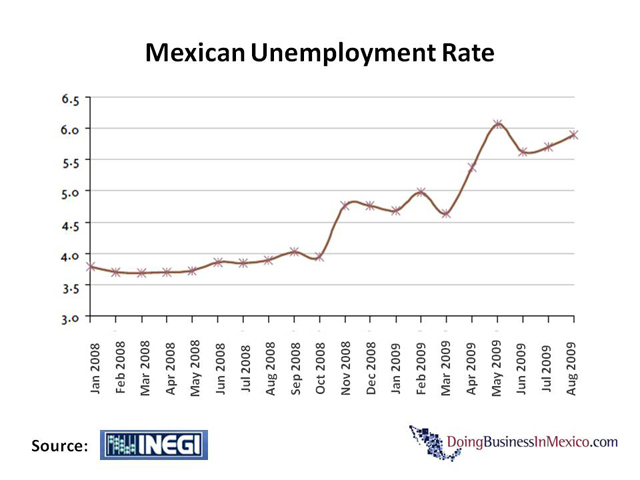 The Mexican unemployment rate has grown more than 50% since Black October and there is no recovery in sight. It might be seen that having an unemployment rate of 6% is not too bath compared to the rest of the world. But, more than one million jobs have been lost during the year and the new youth entries to the economy are facing the lack of job opportunities. At the moment, there is no real job creation. It seems that the government and the private sector are facing the recovery without the need to do new hiring. The need to decrease government expenditure has forced to make significant cuts. The private sector also faced the decrease in demand with labor force cuts; the new paradigm of productivity for recovery is signaling the idea of doing more with less people. In short, a significant unemployment scenario and a lack of job opportunities might be the main crush of the world economic crisis. 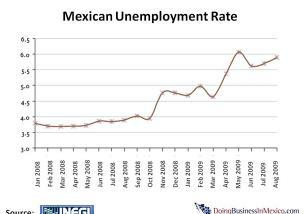 The Mexican economic agenda must address the development of policies for motivating the creation of new jobs, the entrepreneurship and the self-employment.